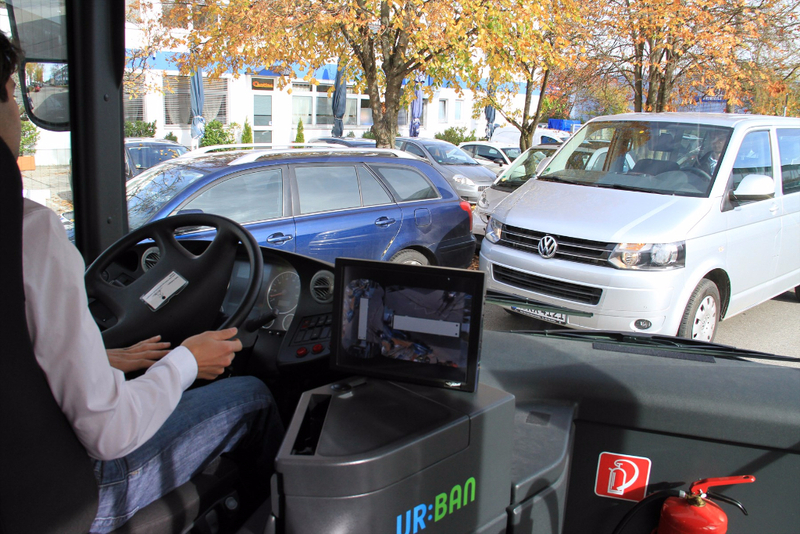 On 7 October 2015, the UR:BAN research partners will be showing the results of a four-year project at the site of Messe Dosseldorf and in real urban traffic. Experts from the three UR:BAN projects will present some 50 demonstration vehicles. 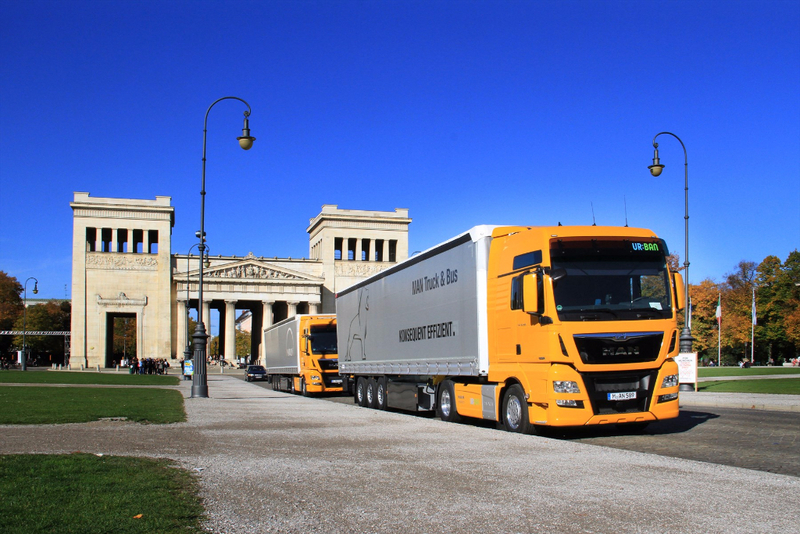 MAN is represented as the only commercial vehicle manufacturer with two prototypes and a walk-in truck cabin. 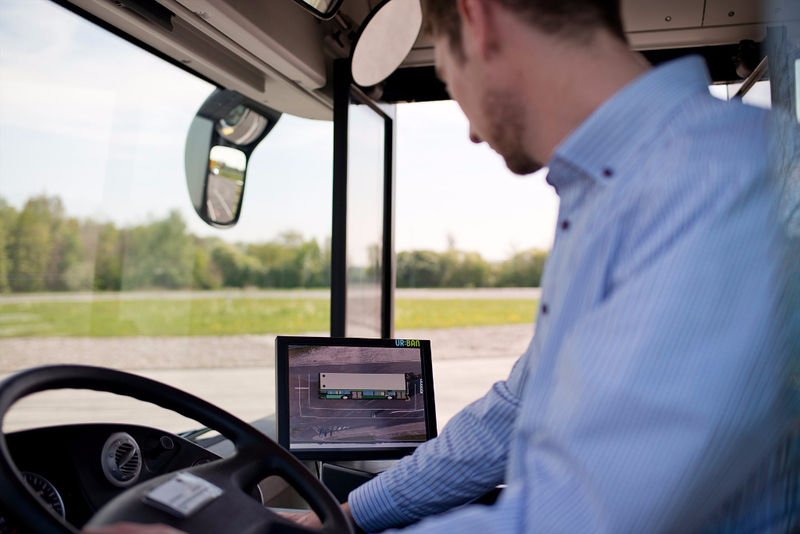 Karlheinz Dorner, Head of Department for Driver Assistance Systems in the Engineering Research division at MAN Truck & Bus explains: “Urban traffic is very complex and places great demands on the development of systems for driver support and automation. 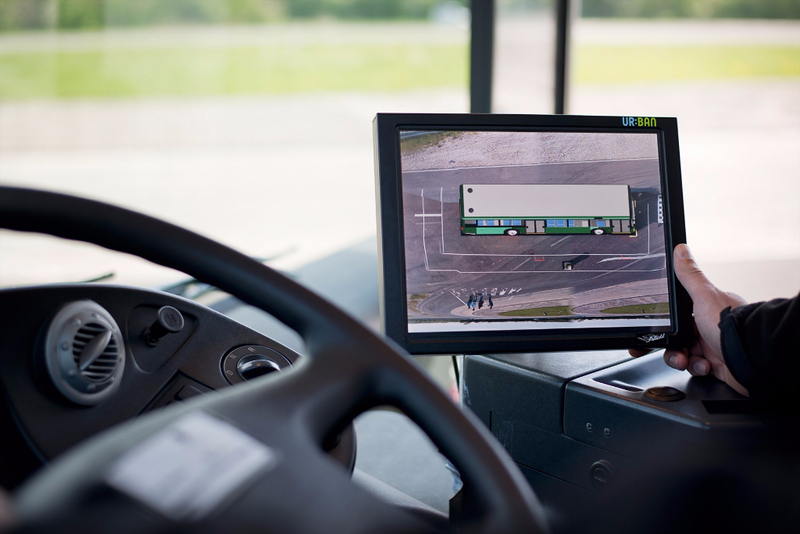 In the sub-project “Human Factors in Traffic”, MAN has enhanced the interface between driver and commercial vehicle (human-machine interface) based on new assistance systems. Cars and commercial vehicles already have a range of electronic assistants to support the driver. The advantage for the driver and others on the road is that assistance systems are always alert, do not get tired and can therefore warn the driver of danger, and if the worst comes to the worst can respond very quickly. In future, we will see more and more of these features. However, assistants should not confuse the driver with displays or warnings. They have to be intuitive and easy to understand. 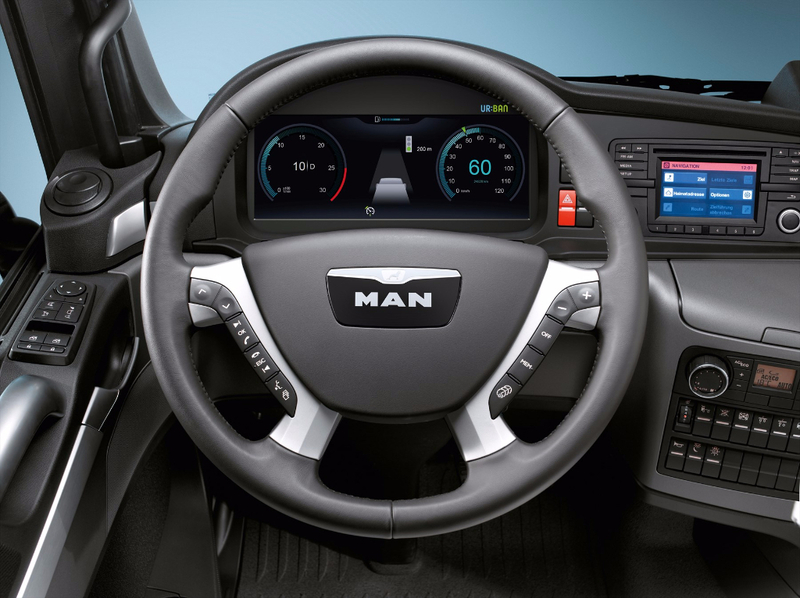 The MAN research team has therefore developed a display and user concept for what is known as “intelligent cruise control”. Using digital maps and communicating with the infrastructure, this system can compile data and events such as speed limits and traffic light phases, or curves and turnings, that are relevant for the vehicle on the specific route. On this basis, this assistant can then calculate the most fuel-effective driving strategy and adjust the speed accordingly. The system can “see” much further ahead than the driver can, but the driver still has to monitor his vehicle. For example, the system already knows that there is a stop sign behind a bend before the driver can actually see truck roll to a standstill earlier. Or the vehicle is driving towards a red traffic light without reducing speed, because it knows that the traffic light is going to switch to green in a few seconds. 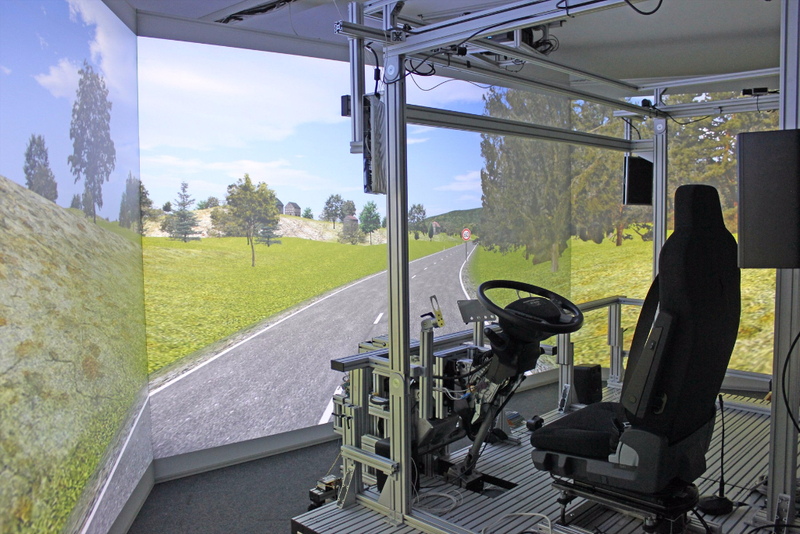 The researchers established what information the driver needs by testing professional truck drivers in a driving simulator in the driving situations described above. The result is a comprehensive display concept, which MAN will show in a walk-in truck cabin in Dosseldorf. In the display concept, a completely digital display replaces the analogue dashboard. “This allows us to design the display for the driver. To ensure that the driver is not distracted by vehicle information, the information has to be reduced to the bare essentials, and be intuitively obvious. The result should be a relaxed, efficient and safe driving experience in the urban environment”, summarises Karlheinz Dorner. MAN has developed a Green Wave Assistant in the sub-project “Networked Traffic System”. This can make optimum use of the green phase of traffic lights, and thus save fuel as well as reducing wear and tear and emissions. “Anticipatory driving saves on fuel – this applies in particular to trucks and buses, as it takes of a lot of energy to accelerate a 40-tonne vehicle from zero to 50 km/h. We can save a lot of fuel by allowing the vehicle to roll, so that it is not necessary to stop and then start again. This is precisely what the Green Wave Assistant can do when it interacts with a suitable traffic infrastructure”, explains Karlheinz Dorner. At the heart of the assistant is an on-board computer that calculates an energy-saving driving strategy based on the available information on traffic light switching on the route. The vehicle uses mobile communication to request information from a server about the switching prognosis for the traffic light system. Based on the data it receives, the vehicle calculates the strategy so that in an ideal scenario it reaches the traffic lights on its route when they are in their green phase. The system can predict several traffic lights on the route, and can also plan in a stop as the most energy-saving option if it is not feasible to reach the green phase. The assistant also considers the quality of the data used for the prognosis. The infrastructure has to be equipped for these new tasks. UR:BAN has also worked on aspects associated with this, in cooperation with the model cities Dosseldorf and Kassel. The driving demonstration in real urban traffic in Dosseldorf uses just this kind of server infrastructure. In contrast to the Green Wave Assistant, which can only give a recommendation for ideal speed, MAN has equipped the truck prototype with an active speed control. The driver can thus leave the optimum speed target to the assistant. It is, however, also equipped with a special distance limiting cruise control, which keeps a safe distance to the vehicle in front, and can stop with the traffic at traffic lights, if necessary. However, for safety reasons, the driver has to actively permit start up. 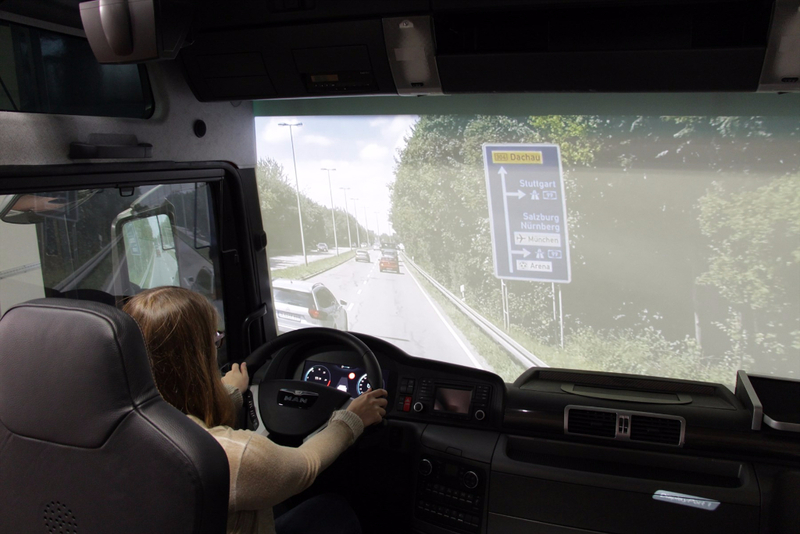 In the sub-project “Cognitive Assistance”, MAN has developed a specially adapted panorama view system for the complex requirements of buses in urban traffic. The UR:BAN researchers will be demonstrating this system as a prototype in the closing event for the project. The system independently recognises the current driving situation and allows the driver to automatically see a perspective on a monitor specially adapted to the situation. Bus driver surveys, among other resources, were used to determine the situations, and to develop the situation-specific displays on the monitor. The situation-specific views were also assessed by bus drivers during the development to ensure continuous feedback. “The camera system gives the driver an intuitively clear overview of what is going on around the vehicle”, explains Karlheinz Dorner. The basic requirements for a system of this kind for use in commercial vehicles were developed in this project: Two cameras were installed on the long sides of the bus, combined with one camera at the front and another at the back so as to be able to show the entire vehicle length, including passengers getting on and off the bus at the front and back doors in good quality. An image is then correlated from the six individual images for each specific situation, which is then shown to the driver on the monitor. A total of 31 companies, universities, research facilities and towns have come together to work on the UR:BAN joint project. They have been working together to develop driver assistance and traffic management systems for urban mobility. Their goal is urban traffic that is both safe and effective – and that flows. The total budget is 80 million Euros. The German Federal Ministry for Business and Energy (Bundesministerium for Wirtschaft und Energie – BMWi) is providing 50% of the funding for the project. Towns and cities are a focus of EU traffic policies, as 70 percent of Europeans live in these areas.